This morning while the loads of laundry were running ... thank goodness we're no longer beating our clothes on rocks down by the river! ... I was upstairs in the craft loft, finishing the 60 baby shower cards, and straightening up a bit. Then I spied my relatively-new, terribly expensive, and unfortunately not well-used Husqvarna Designer Diamond sewing machine. Hmmm. It was sitting there, lonely, already set with lavendar thread. It seemed like a perfect time to try out a decorative stitch around the peach paper. On to the message: Thinking of You, which I have been doing a lot of today and yesterday, wondering if I will attract readers to my new blog. More importantly, I do want to give a bit of the joy back to the many bloggers from whom I get so much inspiration. I hope they know how much I appreciate their work! One of the bloggers led me to Wild Orchid Crafts where I found the most beautiful paper roses, and I'd just received my precious boxful of them from England. Another blogger taught me by video how to make these myself ... which I haven't yet tackled ... but for now, isn't this just stunning? The message, meant for all the paper artist bloggers in the blogosphere, comes from the Cricut Calligraphy cartridge, cut in 2" in both standard (dark orchid) and in shadow (cream, to match the card and the rose). Stickles glitter glue (I'm an addict) in deep purple and opal finished off the butterfly. Voila! 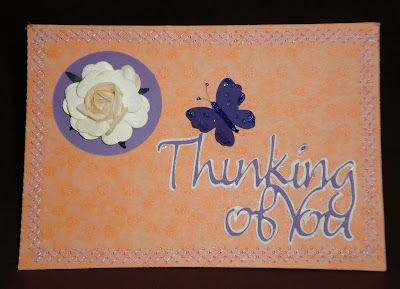 I hope you know I'm thinking of YOU today!